I managed to take advantage of a good weather weekend to get out after the elusive tuna fish. I started out on friday with Vicki Duflo and her group. I was going to start in close looking for lane snapper because it was fairly rough and sneak out later after it calmed. The lanes didnt cooperate so we just slowly headed offshore looking for some tuna fish. 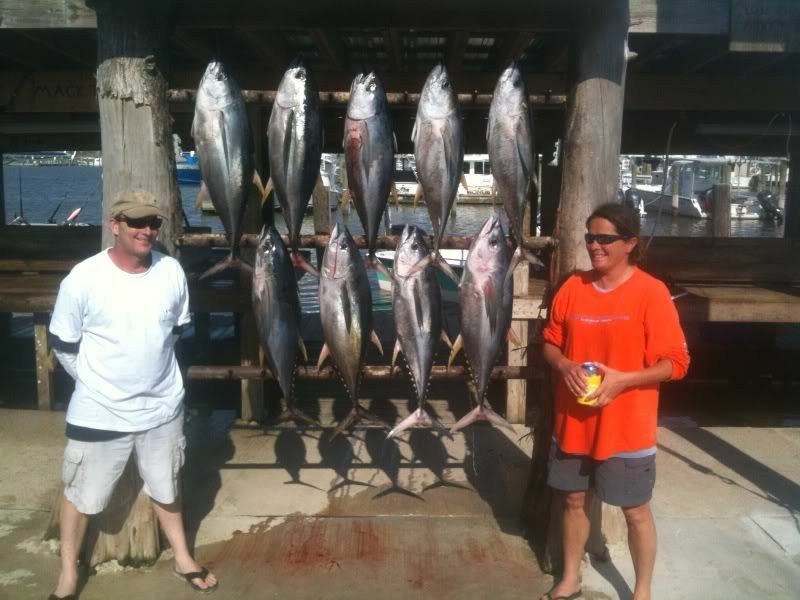 The first stop was ok as we boxed a few blackfin on the troll. Headed out a little farther to a floater and on the first pass we doubled up on yellowfin and then picked up one on a popper while we were doubled up. I put the baits back in and caught another one on the troll before they shut down. They were popping around and we got another on a popper before they turned finicky. I ran over to the next rig and doubled up again before they got finicky on the troll. 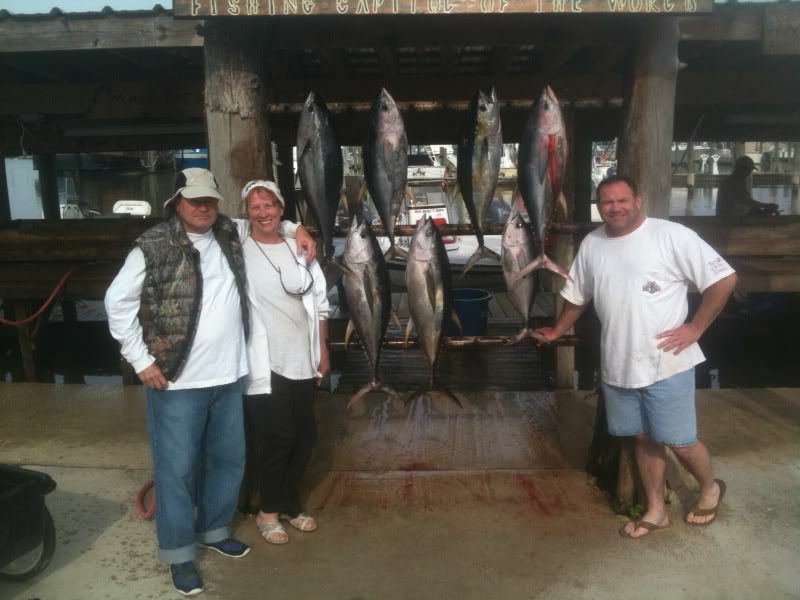 We picked up a couple more on poppers to end the day with nine yellowfin in the 30 pound range. 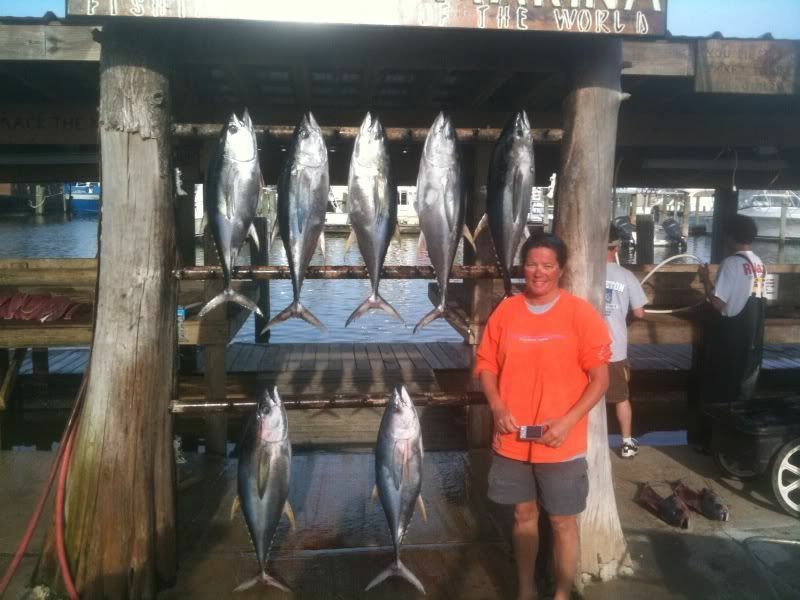 I had Vicki and her group back again on day two and we made a move to another rig to start off to see what was going on. Caught a couple trolling early on as well as one on a popper before they quit eating lures. Settled down to making some chum drifts and picked up another 4 before we called it a day with 7 yf and headed back to the house. I picked up a grouip at the dock saturday night that had driven in from miami without a charter and ran into me while I was fueling up. I told them to meet me at 530 and we would be ready to go. They showed up a little late but we pulled away around 6 or so and headed out. Caught a couple yf real quick on the troll baits before they shut off on lures. Try as I might I could not get one to hit a popper today for anythign. The middle of the day was a lull kinda although we did see plenty of yf busting up on real small minnows. I got over to my last spot and caught one off chum pretty quick. Made another dry drift or two and then set up for a final drift. We missed one and then hooked one on chum and I saw the fish busting again and I threw into them and finally I thought I had gotten one to eat. We landed the chum fish and then we got the popper fish. I had snagged it in the tail so I guess that was just one unlucky fish. The guys were satisfied with 6 yf so we headed to the dock with our catch.